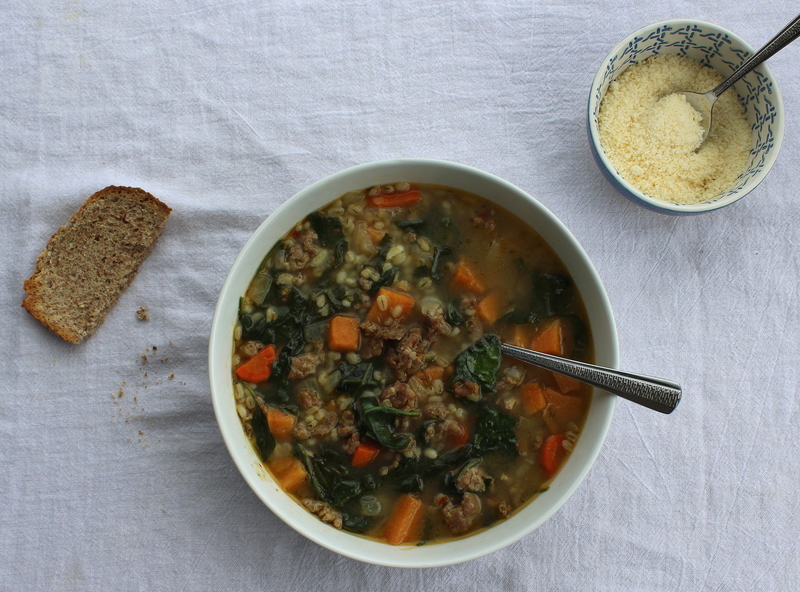 This Spicy Sausage, Barley, and Veggie Soup gives me the warm-fuzzies! I love its heartiness and how it includes a variety of fresh vegetables – carrots, sweet potatoes, spinach, onion, garlic. 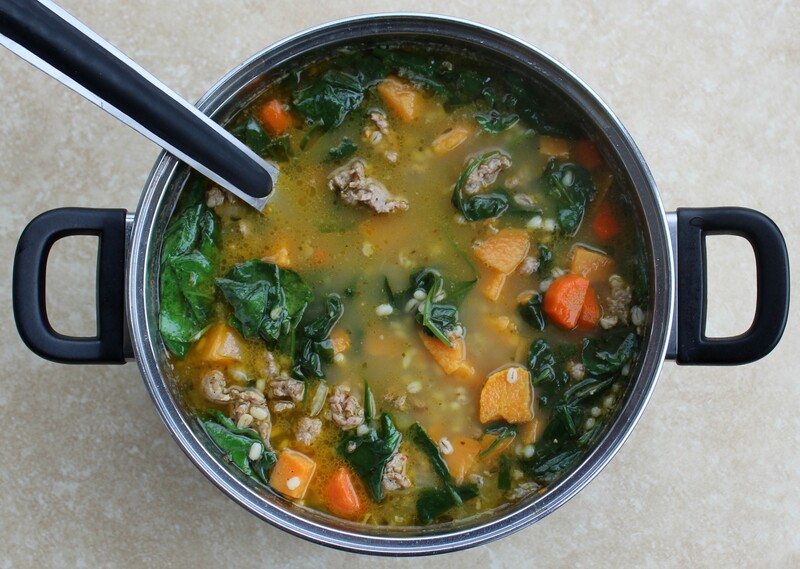 The hot Italian sausage adds a nice heat and flavor, too. If you are not into spicy, you can use regular Italian sausage instead. And if you can’t find hot Italian sausage but want the heat, you can add a half teaspoon of dried red pepper flakes to the soup instead. If you are interested in making homemade chicken stock for this soup from the carcass of a whole bird, I share my method for doing that in this Black Bean Garden Soup Recipe. Preheat the oven to 425 degrees. Add the cubed sweet potatoes to a oven-safe baking dish and drizzle with one tablespoon of the coconut oil. Roast until softened, about 20 minutes. Set aside. Add the sausage removed from its casing to a large frying pan; break it up with a spoon and let it fry over medium heat until no pink remains, stirring regularly, about eight to ten minutes. Drain any excess fat and set aside. To a large pot, add the remaining tablespoon of coconut oil plus the carrots, onion, and garlic and sauté over medium heat until softened, stirring frequently, about five minutes. Then add the sweet potatoes, sausage, chicken stock, barley, and spices. Bring to a boil, then reduce to a gently rolling simmer and let cook for 25 minutes. Add the spinach and simmer for an additional five minutes. And you’re done! 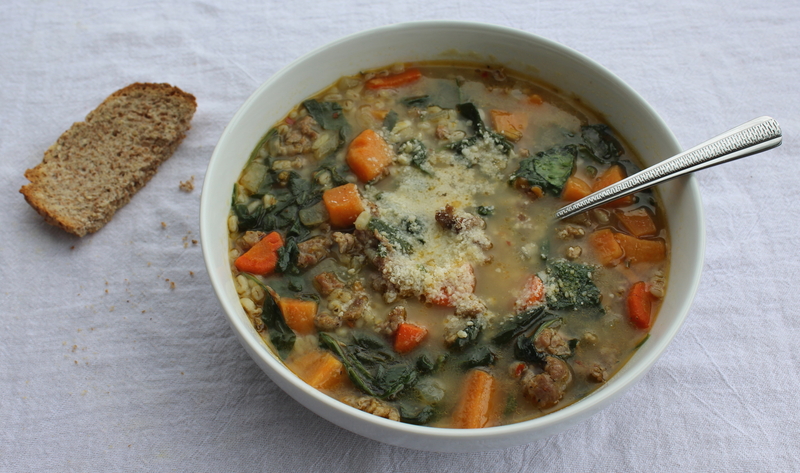 Makes about six to seven hearty servings.